Art Review: "Native American Ledger Drawings From the Hood Museum of Art"
Guns and horses weren't the only "introduced technologies" that shaped the lives of Native Americans in the 19th century. A new way of telling stories also evolved. "Native American Ledger Drawings From the Hood Museum of Art," now on view at Dartmouth College, decodes a selection of about 60 so-called ledger drawings. The detailed pictographic images are among the few surviving Plains Indian chronicles told from their own point of view. Painting and drawing were already part of Native American culture when Europeans began to encroach on their lands with greater frequency in the mid-1800s. Women generally created geometric designs on tepees, pouches and other items. Such designs were imbued with specific meanings, many of which are now lost. Men recorded events with figuration in chronicles such as an annual winter count, in which one image per year indicated momentous events, and on buffalo robes and tepee liners. Plains Indian art wasn't "art for art's sake," but an important means of documenting the people's spiritual and material lives. Beginning around 1850, as natives saw whites keeping ledgers of important facts and accounts in books, they too adopted the format for recording their own important information. Drawing on paper with ink, crayons, colored pencil and watercolors enabled the artists to describe events in greater detail and more easily than they could with cumbersome traditional media. Accounts of hunting, warfare, daily life and courtship appear in the ledger books in the Hood's collection. An anonymous Cheyenne artist's drawing of a man and woman sharing a blanket is on a page from "The Old White Woman Ledger" dating from the 1880s. The two are seen in profile, subtly smiling as they look into each other's eyes. Forms are simplified yet expressive in these drawings. Directional brushstrokes give the lovers mass — washes in horizontal strokes describe the blanket, while vertical lines depict hair. Horses are common in the drawings of hunting and fighting. The depictions of warfare aren't just about the killing; they're also about counting coup, the nonviolent demonstration of bravery that consisted of touching the enemy with a hand or a coup stick, then retreating unharmed. But the phrase "counting coup" can also refer to telling stories about such exploits. 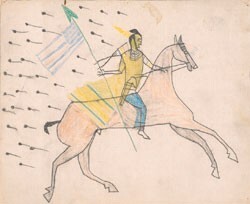 In "Untitled, page #21," Lakota artist Short Bull depicts a warrior on horseback bearing down on an enemy on foot and touching him with a long coup stick. The event was important enough to be recorded by Short Bull, and it's likely he was describing one of his own exploits. A battle between American troops and Mexican cavalry is dramatically spread over two facing pages that have been removed from a ledger book. The Americans are clad in blue, while the Mexicans wear green uniforms. Arrows fly in both directions, and a Kiowa warrior on the American side is slain. Indians fought on both sides in that conflict, though none is pictured here on the Mexican page. In 1876, White Swan, a Lakota, was severely injured at the Battle of the Little Bighorn. About 14 years later, he recorded his story in a ledger. General Custer had employed as scouts six Crow, a long-standing enemy of the Lakota. The scouts advised Custer against entering the valley; unfortunately, he chose to ignore them and made his famous "last stand." White Swan's drawn scene of a horseman dodging arrows records his role in the fight. Forced assimilation led to an important phase in the development of ledger drawings. In the 1870s, defeated warriors from Southern Plains tribes were imprisoned at Fort Marion in St. Augustine, Fla., where they were given an abundant supply of sketchbooks and drawing materials. The Indians recorded their earlier lives, yet also began to describe the regimentation, railroads and cities they encountered in their new, alien environment. Several pieces by Fort Marion inmates appear in the exhibition, including a striking railroad scene with a steam locomotive. While the cultural context that spawned ledger drawings has vanished, the story of different cultures interacting with, and borrowing from, each other remains relevant. As we learn to "read" ledger drawings, the proud and turbulent times faced by Plains tribes more than a century ago appear with greater clarity.